I’ve said it before, but I’ll say it again. I’m incredibly glad that for once I followed my own advice and got my shopping done before Black Friday. Last night, which was the Tuesday before Thanksgiving, William and I went to Fair Oaks Mall in Fairfax, Virginia. Fair Oaks is one of my favorite malls, if not my all-time favorite. This is what we found at the mall last night. Tremendously organized and well-stocked stores. Extremely helpful and gung-ho sales people. No lines to wait in at the cash register or in the restaurants. A very short line for Santa. Parking a-plenty. Even some sales! The Christmas decor in the mall is the same as it has been for a few years now; life-sized stuffed animals, white lights, and red poinsettias. In the center of the mall, there is the big snow globe and a very small Santa’s court, with a Polar Express-The Movie theme. We went through just to get snowed on. Did we ever. We were covered with tiny white plastic flakes. I would not say that was a magical experience, however. Just a little bit fun. It could have been, but it was pretty commercial. It didn’t really say “Christmas” to me. It didn’t make me go aww! or catch my breath. 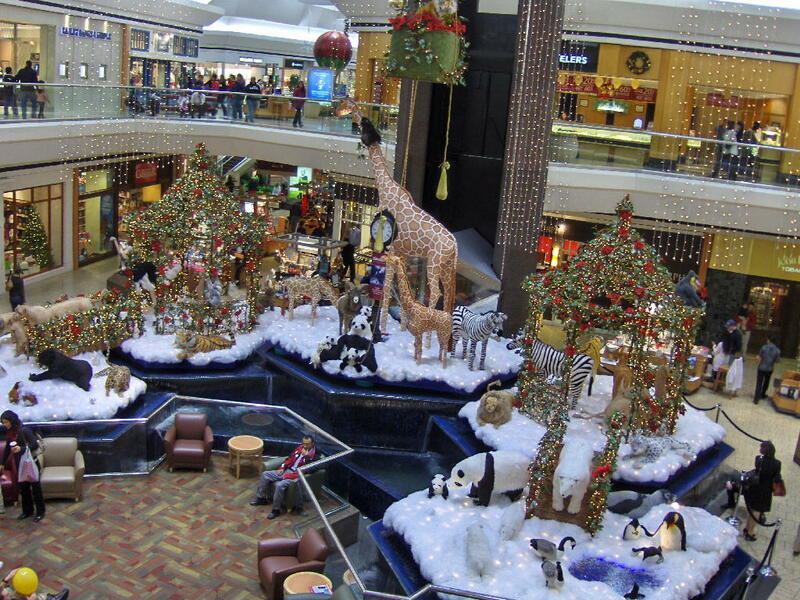 You know, back in the day, Santa lands were set apart from the shopping areas in their own little environments. That’s part of what made it magical; you really felt like you were entering a little fantasy land. That element was missing from this open style set-up. You could clearly see stores, and the elevators, and shoppers all around you. But I think the Polar Express decor also contributed to the plastic and less than magic feel. We found some great deals at JCPenney (which is where I buy more than half my clothes, but we bought something for someone else, I can’t say who, or she might guess what she is getting!). So we knocked one person off the list. Then we had a quick dinner at Maggiano’s Corner Bakery Cafe on the second level of the mall. It’s one of the better and more affordable dining options at the mall. Our dinner came to just over $10 for both us. I like it because I can get half a hot reuben sandwich and tomato soup. William had the plain turkey sandwich. Let me just say that this is the second time I have had the same cashier and he was, as then, super-nice, especially because I always need help deciding what to get, and he never has become impatient with me. Do they ever do customer-service right there. We were happy campers. Then we headed to Bath and Body Works, on the first level, and that really gets five stars for customer service and selection. Bath and Body Works is always a Christmas shopping destination because it is the gift that fits everyone and is non-fattening 🙂 Everybody loves Bath and Body Works. Well, the store looked beautiful. The sales people were incredibly helpful and upbeat. One gentleman working there made some excellent suggestions for two people on my list who are not easy to buy for, and I got my shopping done pretty quickly. Still, I had to browse a bit. This year, they had sparkly lotion in tubes for $5, including my favorite scent of warm brown sugar. One year, I got everybody sparkly body lotion, not realizing that no one I know actually likes their skin to sparkle — except myself. I am all about the glitter. So, I bought this $5 Christmas present for myself and I couldn’t be happier. The selection was terrific. Bath and Body Works had pre-packaged gifts for $10, $15, $20, and more. I did not see a whole lot over $30. I recommend the lip glosses. I use the lime one myself and they are yummy and they really add a nice shine and dimension to your regular lipstick color. This year they are adding them to some $15 gift sets, including shower gel, lotion and fragrance, which is a real bargain because ordinarily just the lip gloss retails for $7. So snap those up! They also had stocking-stuffers: 3 for $10 bath products and fragrances and $1 hand sanitizer. You know you can never have too much hand-sanitizer while flu is going around. This is one recession-friendly place. I really think, in comparison to last year, there were more bargains to be had, and nicer packaging. So, if you have women to buy for (and men, too), this place is defintely worth a stop. We peeked in Macy’s, not to buy anything, but just to look around. Just to compare, a nice gentleman there tried to sell me on the Dolce Gabbana new rose scented gift scents ($70 an $90). Designer status aside, your money could go a lot farther at Bath and Body Works. I politely passed. The clothes that I saw were nice, however. Just out of my budget. I wasn’t buying anything at Sephora, but we walked in anyway, just to check it out. I noticed that they had some very nice sets which would thrill anyone on your list who likes makeup. Go in now and snap up the tiny Sephora compact for $15. I would have bought it myself, except that the only person I could think of who really would love it was myself. Since I already bought myself the lotion, I passed. But hey: the set is amazing. It has 8 or 10 tiny eye shadows in some fabulous colors, 4 tiny lip glosses, and what looks like a powder blush. For $15, you can’t beat it. They also had some great little mascara and lip gloss duos. My favorite set was in the back, and it was called “My First Makeup Kit.” It had some small sizes of a lot of make up essentials that almost anyone would love. They also had some other combination sets, including nice ones from Benefit (pricey but worth it – I recommend the concealer kit which has a sample size of their fabulous pink eye-depuffer, lemon-aid, and highlight beam) And those mini nail polishes (Sephora brand) for $5 are a nice stocking stuffer, too. A friendly young saleswoman was rocking a unique eye shadow look and I complimented her on it. She said that at Sephora, they like to teach their customers how to do different makeup looks, and that she would be happy to show me how to get that look. I passed, but sometime I will take them up on it. She said usually they do one eye and then coach you through how to do the other eye. That sounds like fun to me. By that time, we were ready for something refreshing so we walked to the Piccomolo Italian Ice Cream on the second floor (near Hot Topic). You must check this out if you go to Fair Oaks Mall. I’ve had their gelato before and it’s wonderful. Get the small size; it’s huge, and they give you two flavors. But this time I wanted to try their frozen yogurt. I had it accessorized with fresh raspberries and it was plenty big for William and me to share for under $5. Was it ever yummy! Tangy and not too sweet, no fat, and really refreshing.